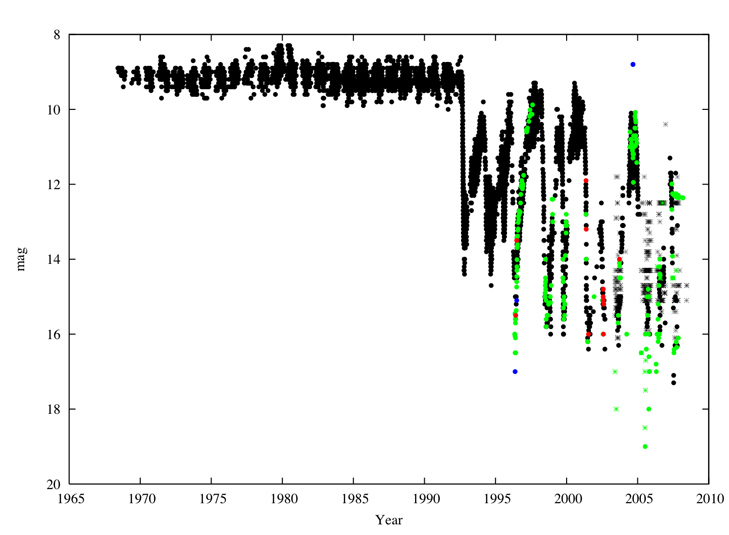 Variable stars change more than most, and more noticeably, too. Stellar evolution, the physical changes that stars undergo from birth to death, is far from completely understood. Because many of these processes take millions or billions of years, we have to infer what changes happen inside stars over time from bits and pieces of evidence. But a few stars are doing interesting things on much shorter timescales, and one of them is our Variable Star of the Season -- the highly-evolved star FG Sge, a white dwarf in the making. 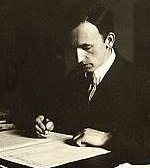 Cuno Hoffmeister of the Sonneberg Observatory. Hoffmeister, the discoverer of FG Sge, discovered many other variable stars during his career. FG Sge was first noted as a variable in 1944 by Cuno Hoffmeister, but the star received scant observer attention (at least in printed papers), until 1960, when G. Richter published a study of the long-term photometric and spectroscopic behavior of FG Sge (or "377.1943 Sge"). The brightness of FG Sge increased by over four magnitudes since the start of the century, and he found evidence of smaller, short-term variations as well. Richter saw signatures of a nova in objective prism spectra, and he likened the star to the Z Andromedae-type symbiotic star AG Pegasi. Since then, many papers have detailed the remarkable evolution of FG Sge from a faint, hot, blue post-asymptotic giant branch star and planetary nebula in the making to a much cooler and brighter yellow supergiant. Even more exciting for variable star observers, following FG Sge's four-magnitude brightening and several decades of relative constancy, the star now appears to exhibit the dramatic and seemingly random fluctuations and fadings of the R Coronae Borealis class of variable stars. FG Sge is clearly a star undergoing extreme changes, and we're fortunate to be treated to its amazing show. 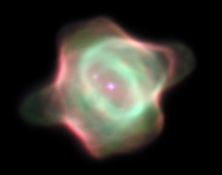 the expulsion of the outer layers of the star, leaving behind a fading planetary nebula with an inert white dwarf star at its heart. The pace at which these changes occur becomes increasingly rapid; main sequence evolution may take billions of years, red giant evolution may take many millions of years, and AGB evolution may take a few million years. But the time from the AGB to the planetary nebula stage is measured in thousands of years, and some very large changes may occur of a span of decades, observable in a single human lifetime. Although there are billions of stars in our Galaxy, the end stages of a star's life are so short that we're lucky if we get to see just a few stars exhibiting these changes at any given time. We're pretty lucky indeed to see a spectacular show like that of FG Sge! Image of the FG Sge field, including the young planetary nebula surrounding it. The nebula is about 30 arcseconds across. Image by Msgr. Ron Royer, from the November 1998 Variable Star of the Month article. In their excellent 2006 review paper, C.S. Jeffery and D. Schönberner assessed what we know (and think we know) about this amazing star, comparing the many years and many layers of observation and analysis to an "archaeological dig" -- using the historical record to understand the past and predict the future. And FG Sge has had quite a history. At the time of its discovery, FG Sge (or "377.1943 Sge") was what is known as a post-asymptotic giant branch star or "post-AGB star". 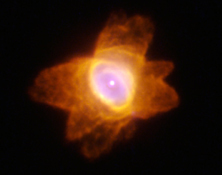 It had evolved through most of the thermal pulses that occur on the asymptotic giant branch and had begin to blow off its outer layers as a planetary nebula (Hen 1-5, discovered by Karl Henize in 1961). The star probably began to brighten in the late 1800's as a result of a late thermal pulse, the nuclear ignition of a thin helium shell surrounding the inert carbon-oxygen core of the star. As with thermal pulses on the AGB, the result of this was that the post-AGB star brightened considerably as its outer layers expanded due to the enormous amount of energy released by the shell. Somewhat counterintuitively, like all giant stars, FG Sge became cooler as its luminosity was distributed over a much, much larger surface area. As a result, FG Sge became much brighter but also much redder over several decades. Prior to the dramatic fading experienced in the early 1990's, it was classified as a yellow supergiant rather than a faint, blue proto-white dwarf. That's quite a change in less than a century! Another change that stars undergo late in life is a change in chemical composition. On one hand, stars begin to lose mass from their outer layers, and much of what is lost at first has the relatively unchanged chemical composition the star had at its birth -- mostly hydrogen and helium. A larger and larger fraction of the remaining mass of the star is then composed of material that has undergone nuclear fusion in the core. On the other hand, the physical process of convection is very strong in cool, giant stars, and during the end stages of a star's life, convection can even dredge up material from all the way down in the core of the star. It was once thought FG Sge might be in the process of dredging up some of this processed nuclear material. The extreme chemical changes suggested in earlier studies of FG Sge are probably not real, but it is clear that the star is changing. AAVSO light curve of FG Sge. Black points are visual observations; green are V, blue are B, and red are Rc-band observations. FG Sge declined sharply in brightness in 1992, much like the R CrB stars; it is believed the star became dust enshrouded at this time. The R CrB-like fadings and rebrightenings have continued to the present. Like many AGB stars, FG Sge already shows enhanced spectral signatures of many metallic elements known as s-process or "slow process" elements, those that can be generated by slow neutron capture. (The AGB stars are the originators of the s-process elements we see on Earth today.) Beginning in the 1960's and continuing until relatively recently, there were a number of spectroscopic studies of FG Sge that suggested the star might be in the process of mixing nuclear-processed core material to the surface as we're watching. Since then, very careful analyses of stellar atmosphere models, post-AGB star evolution models, and much photometric and spectroscopic data now shows that such a recent enhancement of s-process elements has not occurred. However, things are changing. The hydrogen abundance at the surface is decreasing, most likely because of mass loss -- it is after all a planetary nebula in the making! The helium abundance at the surface may also be increasing, and this may be a sign that a dredge-up event is underway, and has just reached the fringes of the core. Confirmation of that may require several decades (or centuries) of observations, including those by variable star observers like you. Although it's not clear that the overall chemistry is changing right now, it certainly did change in the not-too-distant past. One important change caused by a past dredge-up event was an enhancement of the element carbon relative to oxygen. When the carbon abundance exceeds that of oxygen (C/O > 1), the star becomes a carbon star, much redder than other AGB stars where the oxygen abundance is less than or comparable to that of carbon. Because FG Sge has also been cooling, the increased carbon abundance allows the formation of carbon (C2) molecules, which are an important component of dust around AGB stars. Indeed, as many of you discovered for yourselves around 1990, FG Sge suddenly became dust enshrouded, leading to a dramatic decrease in brightness similar to those observed in the R Coronae Borealis stars. These irregular fadings have continued, and FG Sge remains faint right now. It's an open question of how long this behavior will continue, or whether observers will be in for even more changes in the coming years and decades. But it's likely that FG Sge will continue to show dramatic changes in behavior until its nuclear-burning helium shell finally runs out of gas, a process that may take several centuries. As with many AGB stars, your observations -- and those of observers who will come after -- may well be used by future astronomers and astrophysicists to understand this curious star. The cosmic "archaeology" that Jeffery and Schönberner undertook in their paper will continue well into the future! There are a few other stars thought to be nearing the end of their lives, too, including V605 Aql and the famous Sakurai's Object -- V4334 Sgr, which was itself a topic of our Variable Star of the Month series. Both of these objects seem to show what FG Sge will be like many centuries or millenia hence. V605 Aql seems to once again be an extremely hot star, and is settling back onto the post-AGB or white dwarf cooling track after one last thermal pulse. And the spectacular Sakurai's Object might just be a star that experienced this last very late thermal pulse (VLTP) while we watched. Indeed, it was considered a slow nova when it was first discovered, but it is now clear it is a single star rather than a typical binary nova progenitor. Both stars have faded back to near invisibility in the optical since their discovery. Although rare, FG Sge does have at least a little company in the Milky Way! A notable counterexample is V838 Mon, another supposed nova from 2002. Although this famous object with its stunning light echo remains somewhat mysterious, it is most likely not a single evolved star but an even rarer event -- a stellar merger. The rapid increase in brightness was likely caused by the merger itself, while the surrounding dust shells may have come from mass loss by one of the pre-merger stars if it was highly evolved. Such cases of stellar mergers are even rarer than catching a star at the end of its life -- an important exception to the rule when you see hoofprints, think horses, not zebras! FG Sge is a challenging object to observe. It's very faint now, below 15th magnitude, and lies within a crowded Milky Way field. It is also surrounded by nebulosity -- the planetary nebula it ejected prior to its current activity -- and while it should be easy to pick out in the field, it won't be so easy to photometer! When you obtain charts via VSP, we recommend you create them with DSS images rather than plotting points; and make sure you report the brightness of the central star, rather than the entire nebula! The integrated light of the nebula is much brighter than FG Sge itself right now. Both visual and CCD observations are needed, including fainter-thans. Many of the most recent observations submitted are fainter-thans, and these will be useful for long-term studies; knowing that the star was fainter than 15 is a good constraint on its behavior, even if we don't know what the actual magnitude was. If you're a CCD observer and can do multicolor photometry, try taking images in all of the photometric filters you have available. What color is FG Sge? What color is the integrated light of the nebulosity? The nebula is approximately 30 arcseconds across, so it will be resolved in most telescopes. Try to make a multicolor image if you have the software -- photometry is important, but the field will make a lovely astrophoto as well. If you get a good image, let us know, we'd love to see it! FG Sge is observable all throughout the northern hemisphere, and from most populated areas in the south. It lies within the Milky Way (at a Galactic latitude of -7°), which itself makes for a beautiful target at this time of year. It's near the eastern edge of the constellation Sagitta, a small but prominent arrow-shaped constellation sandwiched between Vulpecula (to the north) and Aquila (to the south). Look for the Galactic globular cluster M71 not too far to the west. Our Variable Star of the Season, FG Sge, will be doing interesting things for many years -- if not centuries -- to come, and is sure to provide an interesting show for variable star observers for a long, long time. Stars like FG Sge are beautiful, but they teach a good lesson as well. Even things as giant and stately as the stars in the sky come to an end, and we're fortunate to be witnessing one such event in our lifetimes. Although the final death throes of FG Sge are less dramatic than the supernovae that come to mind when we think of the passing of stars, its end will have no less spectacular consequences. FG Sge itself will become an another anonymous white dwarf among billions in our galaxy, but its ashes will be swept up into new generations of stars, and maybe even new generations of star gazers, too. We hope you get many chances this season to enjoy our lovely Milky Way, and perhaps catch a glimpse of FG Sge's swan song.